Jimmy Coyne, born in Azilda Ontario in 1894 was lured away from his father's farm by the irresistible romance and power of the steam era. In 1913 he hired on as a fireman for the CPR running out of North Bay for a short time and also worked in construction for the Canadian Northern Railway. 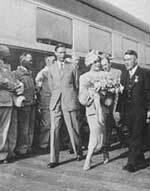 His career with the CNR (Grand Trunk Railway) began in 1915. 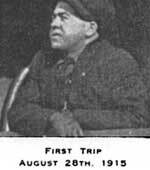 He was promoted from fireman to engineman in 1918 and at the time of his retirement was senior man in the Central Region, having been 'up front' on transcontinental passenger trains between Capreol and Foleyet and Capreol and Brent for some years. "As you run through the years to come may your roadbed be rock ballast, your engine rubber-tired with a continuous head of steam and with headlights on." Many of the young fireman and brakemen who worked with him could attest to his skill at spotting an engine and keeping the stewards in the dining car happy! They might also remember his uncanny ability to waken from a nap a moment before it was time to blow the whistle for a crossing. Then there was the container of brasso that he carried in his glistening, copper lunch box used for buffing up the gauges. It was rumored that they nicknamed him 'powder-puff', a name he accepted in good humor. As a girl growing up, I remember how fastidious he was about his general appearance even on the job. The railway was a way of life but not all encompassing in his case. 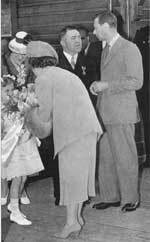 During his tenure as mayor he had the honour and privilege of greeting Their Majesties King George VI and Queen Elizabeth in an unscheduled walk about during their tour across Canada in 1939. Ever the adventurer, like his Irish ancestors before him he tried his luck in the search for gold. Jimmy joined the Meteor Lake Syndicate and spent several years placer mining along the shores of the Vermilion River with Jimmy Reid, Hugh Craig, A.M Moffatt and A.A. Stewart but they failed to find the pot of gold at the end of the rainbow. In the late 20's when the highway to Sudbury was constructed, Jimmy and his brother Phin built and operated a service garage boasting one Shell gasoline pump and a cement pit. Littering the backyard as I remember could be found, at various times and in various states of repair, Nashes, Studebakers, Willy's and one old Packard when my dad took over the Hudson Terraplane car agency. Jimmy Coyne was a character, one who was never too busy to entertain his grandkids or help his neighbor. He left a legacy of humorous spontaneity to ordinary situations. Life's challenges were taken in stride and he could break into an Irish gig whenever the spirit moved him, to the advanced age of 85. He was irritatingly stubborn as only the Irish can be, unmindful of time and he loved to live in the limelight. Reflecting on the words, I did it my way from Frank Sinatra's famous song, in truth, sums up the life of Jimmy Coyne.